As has so often been the case on this trip, it’s the unexpected pleasures that turn out to be some of the fondest memories. 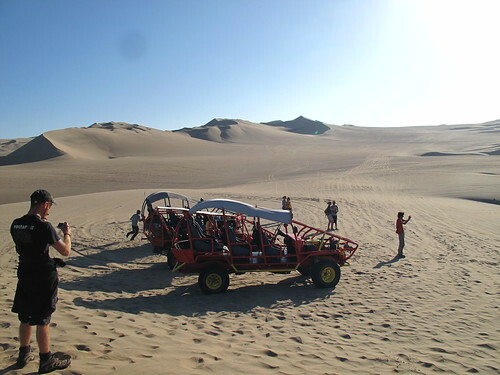 Huacachina is definitely a place to fall into that category. 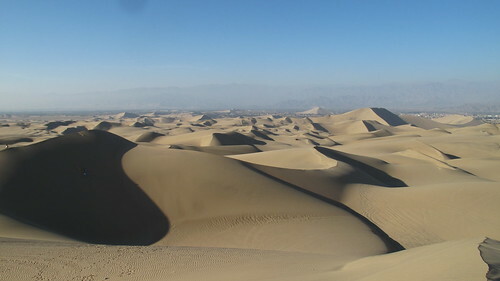 Just south of Pisco along the Panamericana sits Ica, which is surrounded by a desert landscape with some of the world’s biggest sand dunes. Right in the middle of those dunes sits the little oasis of Huacachina, a pretty little lake surrounded by palm trees, a pleasant little promenade, a few restaurants and cafes and a handful of hostels and hotels. And that’s it. It totally lived up to my expectations of what an oasis should be like, and I could have happily spent days hanging around by the pool in my hostel, soaking up the sun, chilling out with a book and admiring the gigantic dunes that towered all around. 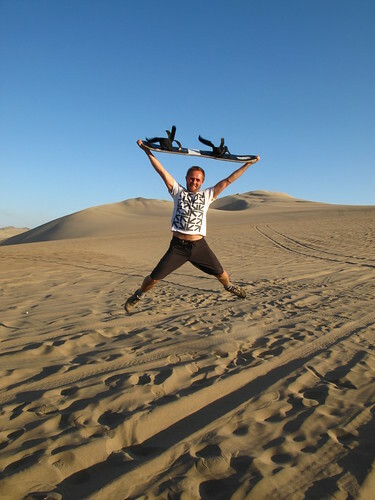 Unfortunately I had no time for that, as I was headed south in a hurry, so I had to make the best of it and jumped straight into the other thing that makes the place a must-see on the backpacker circuit: the sandboarding. I must admit, much like the mud volcano in Colombia it was something I was doing more because it was there than out of any real enthusiasm. Yet again, I was more than pleasantly surprised. The trip starts off round the oasis as we all piled onto a dune buggy to drive us up to where we’d go boarding. But far from being a simple means of getting from A to B, the buggy was as much as part of the experience as the boarding was. Our guide drove like a maniac across the dunes, bouncing around across the sand, shooting up the steep slopes at a rate of knots and then plunging down the other side again. It made the average rollercoaster ride seem tame and I loved every single second of it. I was giggling away like a madman as we got thrown around at ridiculous speeds, and the thought we might turn over any second made it all the more fun. After all that, I was worried the sandboarding itself would be a disappointment, especially as I’ve never snowboarded before (I wonder why they don’t do sand skis??). We started off with three relatively gentle practice dunes, which I went down standing up, snowboard-style. And I was useless. I kept falling off, and even when I did start to get the hang of it it was all pretty slow. So when we drove off again to the serious dunes, I was hoping for something a little more fun – and I got it. The fourth dune was stupidly steep and very high, and we were instructed to go down lying on the board, head first, and using our toes to brake with. It was awesome, flying down at a ridiculous speed, with the knowledge that it would soon even out slowing you down naturally. After that, we had three more, with the final one being the biggest of them all. Most people were gingerly making their way down standing up, but I was having none of that. I wanted one final adrenaline fix, so I jumped on head first, keep my feet firmly off the ground (who needs brakes?) and plummeted down without stopping. By the time I hit the flat bit I’d gained so much speed the board was bouncing up and down off the ridges in the sand like a thing possessed (leaving me with a lovely bruise across my pelvis) but it was worth every bit of pain. I was just gutted I didn’t have time to stay another day to do it all over again.